Havana has been acting lethargic for about a week, and more recently, she’s stopped waking up to roam around almost altogether. She’s definitely doing this because she’s going to shed in the next few days or weeks. Just before she went into this state, Thomas and I tried to tidy up some of the feces in her cage while she was still in it, and she got put on edge and struck at him. He moved in time to keep her from biting him, but we figured something was up because she’s never tried to strike or bite at us before. She must have been overly anxious and not feeling quite well because she was starting her pre-shedding phase. 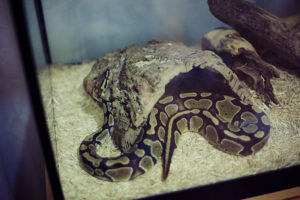 If that isn’t proof that ball pythons like to burrow, I don’t know what is. Zoo Med Reptitherm Under Tank Heater (3040 gallons) 8" by 12"
There’s no way that Havana could have burned herself doing this (even though the heat mat is beneath the glass on this side) because under the layer of fluffy aspen, there’s an enormous layer of incredibly flattened aspen bedding that she can’t get underneath. 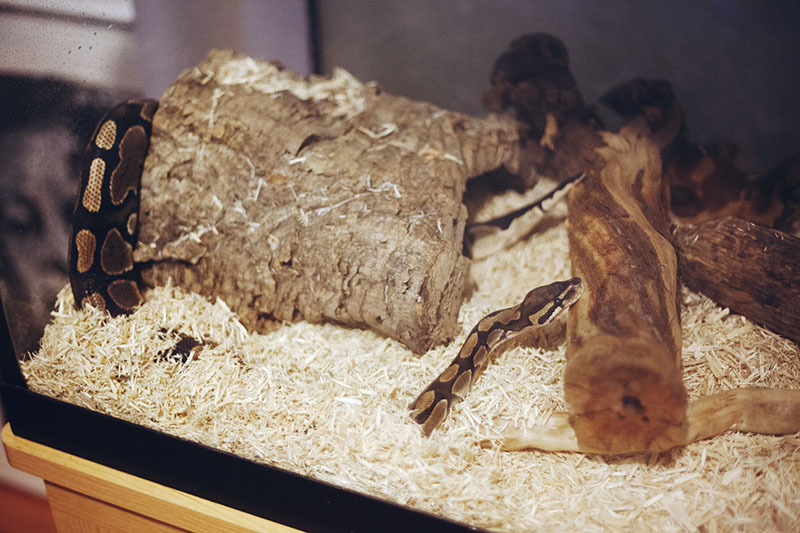 She flattened out that layer, and all the other aspen in her enclosure, by slithering over it so often. Usually we only replace small amounts of aspen based on how much we take out with the feces and urine. 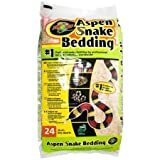 This is the first time that I placed enough aspen bedding for her to burrow under, and clever her, she figured it out pretty much immediately. So this is the first time Thomas and I have seen her burrow, but it likely won’t be the last. 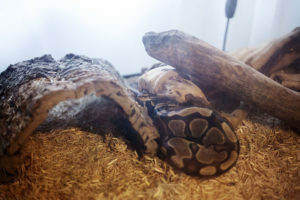 I’ve heard a lot of other ball python owners say they really like doing this, but this is the first time I got to watch it happen, and it’s terribly cute. It must feel especially nice against her skin now that she’s gearing up for a shed. 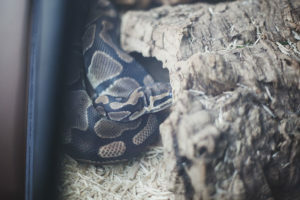 I don’t want to tell you how to do it right but your enclosure looks all wrong. 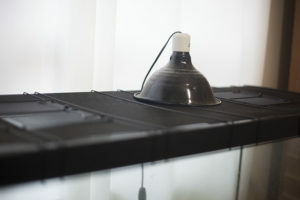 You need two fully covering hide with one hole, one on each side of the tank. 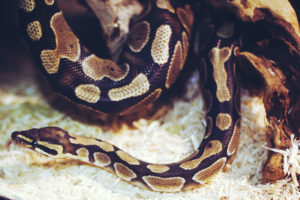 If your BP is active all the time this means your snake is stressed and the enclosure is not adequate. They should only be active during late nights/early mornings or on feeding days. 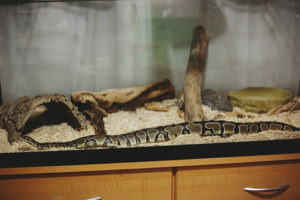 ?They need a substrate like cocomulch or cocochips to keep up humidity, especially in a glass tank which is not reccomended for ball pythons. Plastic tubs or enclosures are preferred. 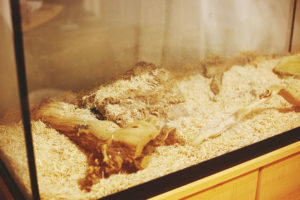 She’s definitely not active all the time, she’s just not sleeping in her hide. 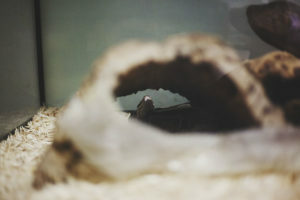 She prefers to sleep curled under the log, pressed up against the glass recently, but she’s sleeping for about 21-22 hours a day. And indeed, she’s only up during late nights/early mornings. 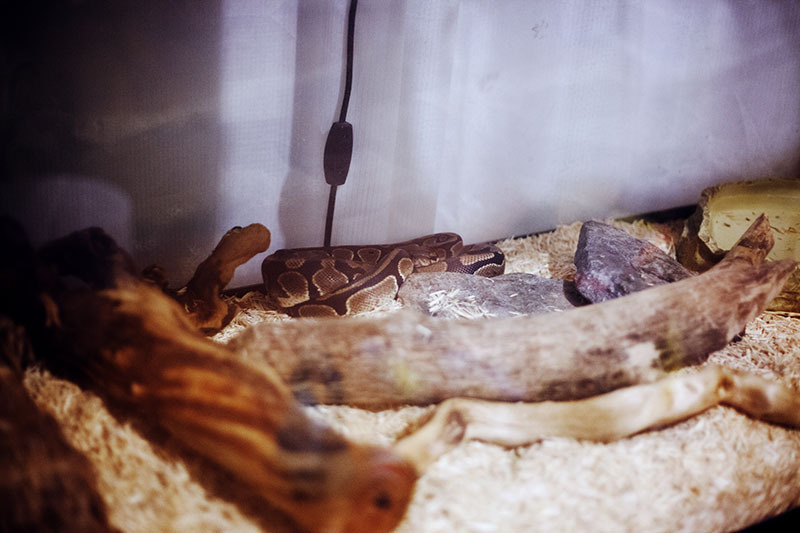 The humidity I’ve been able to keep high with a wet towel above her enclosure, so moisture is not really an issue. 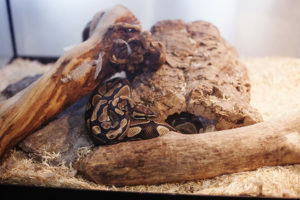 I’ve considered buying a second hide, but one of the ball python breeders I know well and trust told me he prefers to only use one hide, which he keeps on the warm side so that his snakes will sleep on that side. Apparently it’s supposed to help with metabolizing food. Since that hasn’t really been working (since we added the heat mat she hasn’t liked sleeping in her hide), I’m thinking of switching to two hides if she refuses to sleep in her hide after she sheds (as I noted, she never sleeps in her hide for the couple of weeks before she sheds, which is nice because it helps us immediately notice and ensures we kick up the humidity in time). 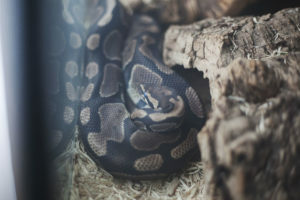 I’ve never actually seen a hide that’s completely closed with one hole for a full-grown ball python, not in stores at least. We were given this one from her last owner when we got her late last year, and the reptile store I go to for her rats has ones that are even more open at the ends, which I don’t like at all. I’ll keep looking around. All things considered, I feel like her stress on the day she tried to bite was either due to my husband maybe smelling like chicken (he’d forgotten that he’d cooked chicken stock just about an hour earlier, and although his hands were washed, his arm certainly was not), or it was due to her starting her shed soon. It of course could be a combination of both. Anyway, thanks very much for your input.